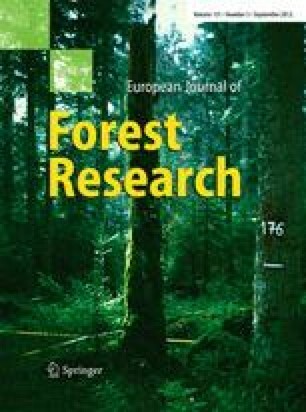 Persistently high activity concentrations of radioactive Cs-137 (T 1/2 = 30.17 a) in various animals and fruits originating from Bavarian forest ecosystems suggest that the contamination of soils in these ecosystems is still critical even decades after the severe inputs following the Chernobyl nuclear accident. Aware of the fact, that such inputs are a global threat that can re-emerge at any time, a new monitoring network was established in cooperation with the Bavarian State Ministry of the Environment and Public Health, to enhance the value of long-term radioprotection strategies in forests. Based on the investigation of 48 forest sites throughout the entire state territory, the project delivers a total of 889 gamma spectrometric records and demonstrates the current Cs-137 contamination situation of Bavarian forest soils, providing a valuable update on the residual contamination levels and thus a comprehensive inventory for any future radioprotection management. First results of this project are presented hereby. The total Cs-137 areal activity densities in Bavarian forest soils currently vary between 640 and 61,166 Bq m−², with the peak areal activity density of each profile being located in the uppermost, humus rich mineral A-horizon in 68 % of all cases. Moreover, the results detect a positive correlation of humus thickness and relative areal Cs-137 activity density in humus horizons (R² = 0.50), validating previous findings on that topic by means of a very comprehensive data set across 2.56 Mio ha forest stands by showing that humus bodies >7.5 cm still contain at least 50 % of the total areal topsoil activity density.